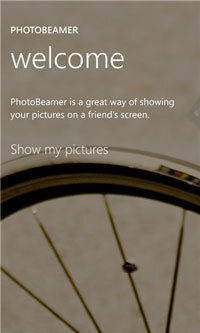 Nokia has announced yet another Lumia-exclusive PhotoBeamer app for Windows Phone 8 devices. The app allows you to show your photos on any screen. Just point your Windows Phone or iPhone at any screen displaying www.photobeamer.com and you'll be able to enjoy your photos anywhere with family and friends. It's a modern era slide projector available anytime, anywhere! - Works on any display sporting a modern web browser - including desktop screens, projector screens, laptops etc. - Show your Windows Phone / iPhone (iOS5 devices) photos on any screen, anywhere. - Zero configuration with no registration necessary. - Works over all connections, including 3G and Wi-Fi. - Choose among themes supporting your mode of presentation. - Progressive beaming using patented Scalado imaging technology, to ensure the fastest possible experience even over slow connections. - No network setup, manual pairing, bumping or similar - connections work out of the box.